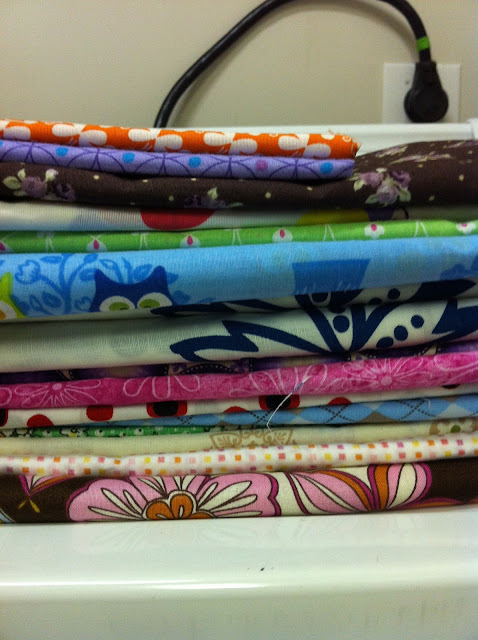 Life at Pemberley: Sew Sew Susie! So all that to say, Hubby is very supportive of my getting back into sewing! This past weekend, I REALLY wanted to make something I'd seen on Pinterest. I thought this looked super cute but then realized I didn't have two whole pairs of jeans that fit right now worth sacrificing. This was adorable, but I didn't know what size tshirt I needed for our little friend nor did I have the tulle necessary for the cuteness. This I was DYING to make, but alas, the instructions I think are in German or Swedish or something that is very much not English. Fail. Then, I discovered this goodness. In English. And it looked so easy. I've been wanting a maxidress forever, and haven't found one that looks good on me and is cute. Those two things together are apparently extremely difficult to find. Go figure. So I'll make one! Except I was terrified. I haven't made actual clothes since middle school (which were not at all in fashion, despite the super cool neon tie-dye knit fabrics I chose). I didn't want to cut my beloved fabric that I'm still mesmerized with. 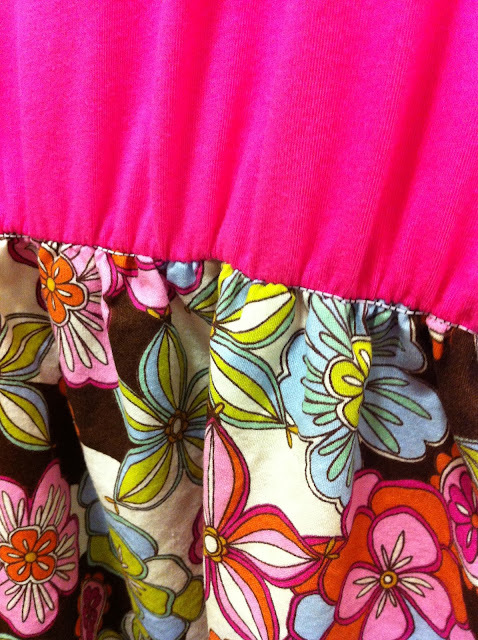 I'd never sewn with elastic thread, much less sewn ruffles. But I did it anyway. I figured if I did that poorly of a job with it, most of my beloved fabric would still be intact, so I could reuse the skirt part of the dress. I'd only be out one chopped, cropped workout tshirt that I wasn't in love with to begin with. Yay! Let's get started. Here's a sneaky peek I shared on Insta of the fabric. Don't you love when the back of the fabric is pretty too? Makes me happy! There's my first ruffle! And with elastic thread, which I had absolutely zero issue with (praise the Lord!). Apparently, if you have a Brother sewing machine, you are likely to have major fits, but I have my beloved Singer, so I had no problems, for which I was extremely grateful. In fact for me, the hardest moment was at the very beginning before I even got the skirt part closed in! My bobbin case was dusty and giving me a little bit of an issue. I took everything apart and dusted it all out, and after that- smooth sailing. Woohoo! So here's the finished waistline. The whole point is that you sew the skirt to the cropped shirt (sort of cheating in my book, but I'm not complaining) with the elastic thread, creating the ruffles which give body to the dress and definition to the person's form. I might go over it again since the thread's currently exposed. I didn't like that part, but I sort of ran out of time Saturday to redo it. Here's the finished product, complete with sash to become the waistband and cover the exposed waistline. 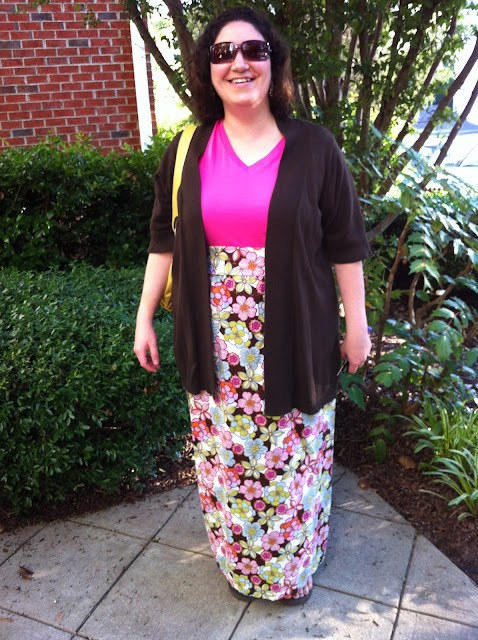 Of course, I did feel it was a bit mu-muu-ish on me for being such a shortypants. I think I want to rip it apart and turn the skirt part into a sundress. It'd be shorter and the sash could then be used for the straps or the top part (since that's my only remaining 'extra' fabric). We'll see what happens. 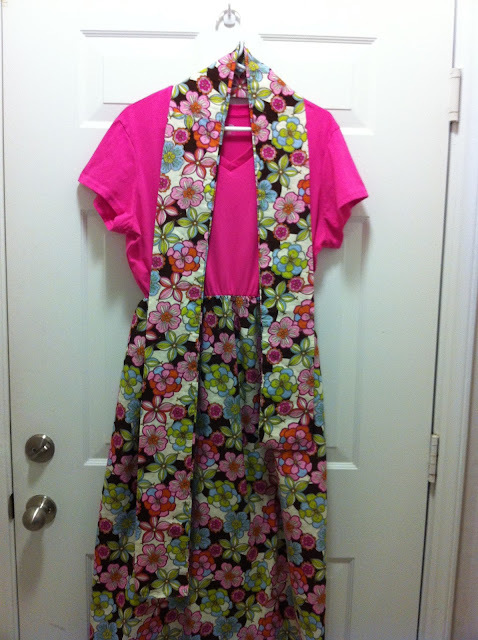 For now, it's living in the closet until I get up the gumption to cut my beloved fabric again. If you want to attempt this or the shorter version of the pin through Pinterest, I'd recommend it. I liked that it wasn't a real pattern. To get the size you need, you just wind the fabric around yourself one and a half times, and then go from there. I had the whole thing done and ready for wearing in under three hours. I call that a success! One more thing... on Sunday, I wanted to sew something else, having been turned into this super sewer on Saturday. But I was tired (we're usually gone from 7:15am to about 4pm each Sunday). So instead I remembered this tank top that was from last summer that I loved, but had gotten too big for me to wear (yay! good problem!). Well, I ended up sewing up the sides to make it fit better. Friends, I took TWO INCHES off that puppy! Yay! Now it's snug and fitted and modest again, which all makes me super excited. That was a super quick and easy accomplishment. With vacation starting on Monday, I'm ready to tackle more! We'll have to wait and see what I land on because I'm still sad to be cutting up all this cuteness. Hubby asked me last night to be thinking of things I want to do on the staycation part of our vacay, and my answer? HOBBY LOBBY! More fabric! My precious! (Err, um, ahem, sorry, I got carried away) Anyway, I hope to be sewing more next week and I can't wait to see what I end up with. Short rant- No Hobby Lobby is planned to come nearer to me in the immediate future. I am extremely disappointed by this (the closest one is an hour away) and I hope others feel sad too. I'll be linking up with Jessica's PinterTest Kitchen; join us, won't you? okay this turned out GREAT! love the fabric SO SO much, and the hot pink top. cute post title - adorable. and i think you should get pajama jeans. LOVE LOVE LOOOOVE. Secretly jealous that I am not nearly as brave. You give me hope. And do not listen to Kim about the PJ jeans. Awesome, awesome post. Thanks for linking up, friend! I absolutely LOVE the dress you made and my mouth is still wide open that you made that (not that I didn't think you could, but that it totally doesn't look handmade). :) Love your choices of fabric!